Dr. Annie Pearce (right) receiving the “Big Al” Hall Humanitarian Award, presented by Radford City Councilman Harshberger. Animal Control Officer Adele Katrovitz (left) made the nomination. 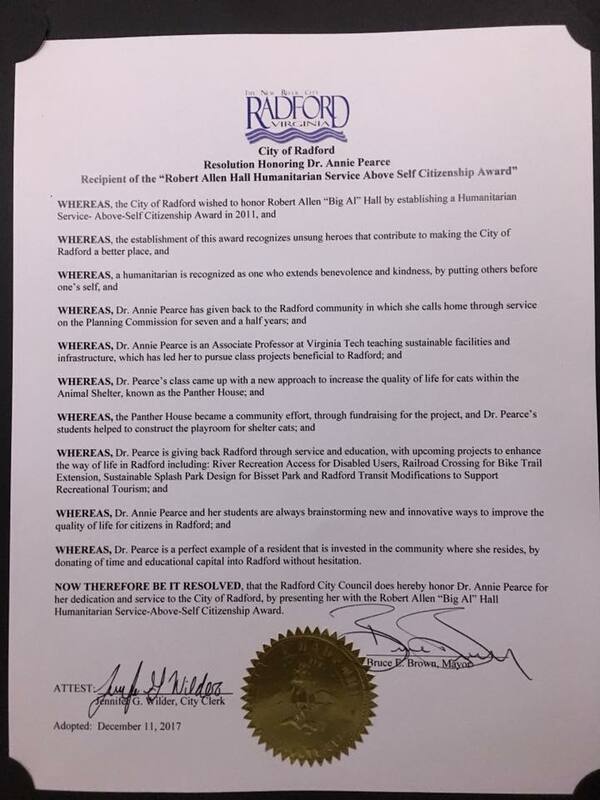 Radford, VA – Dr. Annie Pearce, an Associate Professor in the Department of Building Construction and the Myers-Lawson School of Construction was presented with the Robert Allen “Big Al” Hall Humanitarian Service-Above Self-Citizenship Award. Councilman Harshberger read “Whereas”s listing Pearce’s accomplishments and honoring her service to Radford recognizing her as “a perfect example of a resident invested in the community,” Dr. Pearce and her students “are always brainstorming new and innovative ways to improve the quality of life for citizens in Radford.” The resolution thanked her for her dedication and service to the city, which was unanimously approved to loud applause. 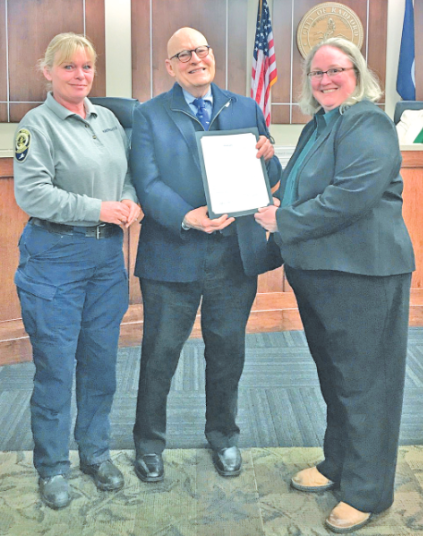 The mayor thanked Adele Katrovitz, Radford Animal Control Officer, for bringing Dr. Pearce to the attention of the council and encouraged the community to recommend their “hometown heroes.” “One of the things we like to do is recognize the hometown heroes. And you all know who they are. If you have recommendations, we much prefer they come from you. We just ask that we let one of us know,” Mayor Brown said.